RingByName set out to do something different with their virtual phone service. They have been around since 2004, offer more features, include IP phones, and try to help businesses establish better customer relationships. But, their features do require users to sign up for a contract period. Overall, it is an acceptable service provider – especially for companies that want as much as possible for the price. An alternative virtual phone system provider with unique features and phones included. RingByName offers four basic plans, each requiring a one to three year contract period. While you do get a 30-day money back guarantee, they are not upfront about their prices. They brag about their lower prices and more features for the price, and brand themselves as the company that provides “honest pricing” yet, there are no prices on their site. In reality, their startup costs average over $400 (including shipping) and users can expect to pay $230 per month for a ten-line PBX plan. Users can have as many extensions as they want, but there is a fee per extension per month. International calls are charged separately and the rate depends on the country. Users get unlimited calling and a free phone (as long as they sign up for the two-year contract). But, free does not mean the user won’t pay for shipping. Plans can accommodate over 21 users, activation is free and porting a phone number is free as well. If a user wishes to cancel, they still must pay to ship back the equipment and will only get a refund if they do so in the 30-day period. RingByName takes a different approach to call management. They want to help business users extend their reach and improve customer relationships. The call management tool offers call logs, voicemail access, client contact information and call routing through an automated receptionist. There is a mobile phone app and desktop app for call management, but this is only available to the administrator and setting up permissions is very difficult. 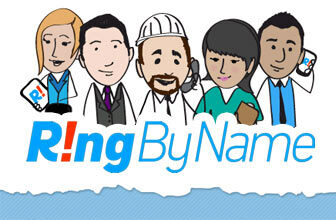 RingByName offers vanity, local and toll-free numbers. Porting a number is allowed, and free. But, purchasing a vanity or toll-free number will come for a price – which is not disclosed by the company. RingByName is all about improving customer relations, which is why they offer their innovative caller ID feature. This allows companies to input customer information (including a picture) so that it shows up when they call. Calls can also be automatically set up to route to the customer service rep or team member the client spoke to previously. It does integrate with Outlook, Google, Salesforce and 25 other services. It offers a virtual receptionist and custom message and can greet customers by name. They do not have a call queue, only a call routing system. There is no conference calling and their feature list, while included, is very basic. The service, while innovative, is not very user-friendly. It can be difficult to setup, and despite the fact they have a lot of tutorials, tech support is exclusive to the administrator only. There are now advanced call analytics, so users only can see call logs to assess their service needs. While they have excellent support, including a FAQs section and tutorials, only administrators can submit help tickets or speak to customer service via chat. Telephone and email support is locked to administrators only as well. RingByName does not offer an SLA, but claim to be up 99 percent of the time. Compared to other big name virtual phone system providers, RingByName has a small number of servers, but does offer a fully redundant network. Phone Support is only available from 9am to 9pm PST. Prices for RingByName are based on a new, three-year service agreement. 1 to 5 Users: Unlimited calling, free desk phone per user, free CRM integration. Starts at $39.95 per user, per month. 6 to 10 Users: Unlimited calling, free desk phone per user, free CRM integration. Starts at $34.95 per user, per month. 11 to 20 Users: Unlimited calling, free desk phone per user, free CRM integration. Starts at $29.95 per user, per month. 21 or More Users: Unlimited calling, free desk phone per user, free CRM integration. You must call for a quote. Free IP Phones: RingByName offers free IP phones per user as long as you sign up for the two-year contract. You are required to pay for shipping though – so it may not be 100 percent free. Toll-Free and Vanity Numbers: Not all virtual phone services offer toll-free and vanity numbers, so it is nice to see a company that does. While they are not clear how much these services are, it is still a bonus for businesses that need toll-free numbers. Free Number Porting: If you already have a number for your business, you will be able to port that number (transfer it) over to RingByName for free so that you don't have to hassle with changing your number. Innovative Caller ID: This is definitely a feature that no other virtual phone system provider can brag about. RingByName tries to strengthen customer service for their business clients by offering innovative caller ID solutions. This allows the administrator to input contact information and even a client photo, so when they call, their information shows up. Also, administrators can have certain clients automatically routed to the person they spoke to last and even greet them by name via the automatic attendant. 30-Day Money Back Guarantee: If you do not like RingByName, they offer a 30-day money back guarantee, which means you will be able to return the phones and stop service. You may have to pay for shipping to return the equipment, but you will still get any upfront fees and service costs you paid refunded as long as you cancel within the 30-day period. Integrates with Other Apps: RingByName is CRM ready and can be integrated with other apps like Outlook, Salesforce, Google, etc. This gives users more versatility with their phone service. Contracts Required: While you do pay monthly, you still must commit to RingByName in a one to three year contract period. If you want to take advantage of their free IP phone offer, then you must lock yourself into a two-year contract. While they do have a 30-day money back guarantee, some businesses may be turned off by the fact they must sign a contract – especially when there are numerous providers out there that require no contracts. Unclear Pricing: While most virtual phone system providers are cryptic about pricing and do not discuss things like fees and taxes, RingByName calls out those providers for their unclear and outrageous prices, yet they do not offer a lot of upfront pricing on their site. They do not discuss connection fees, monthly fees, how much additional features are, etc. The only way to get a quote is to contact their sales professionals. Because they are not upfront about pricing, some users may just go to another virtual phone system provider that is. Not User-Friendly: RingByName is confusing and difficult to setup – and many users may get frustrated. And, because only administrators can access the help desk or submit tickets, any potential issues could delay use or setup until the administrator contacts tech support. No Call Queue: While they have call routing, at this time RingByName has not created a call queue service – which means companies with call centers cannot utilize their services. Call queues are important, especially with call routing. Because they don't offer both, callers would either go straight to voicemail or have to call back, rather than wait to speak to someone. Limited Call Analytics: The call analytics offered by RingByName are very basic. This may be difficult for businesses that want to track their usage, see line information and assess their service needs better. A fast-growing cloud based phone system. RingByName is a growing virtual phone service that tries to compete with larger virtual phone system providers by offering a different kind of service. They focus on small to medium-size businesses and offer features that other providers keep out of reach.